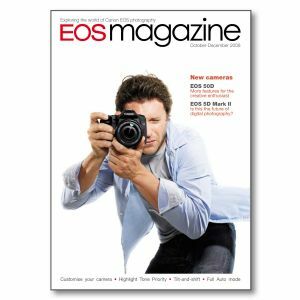 Add this issue to your photographic library for information on the Canon EOS 50D, EOS 5D Mk II, EF-S 18-200mm f3.5-5.6 IS and EF 24mm f1.4L II USM. Plus techniques on Full Auto mode (green square), ring flash, customising your EOS camera, Canon's tilt-and-shift lens used with a 1.4x entender and Highlight Tone Priority. New products EOS 50D; EOS 5D Mark II; EF-S 18-200mm f3.5-5.6 IS; EF 24mm f1.4L II USM. Professional showcase Paul Nicklen tells Angela August how going on assignment for National Geographic magazine is both the best, and the hardest job in the world. Going green The Full Auto (green square) shooting mode on EOS cameras is regarded with distain by many photographers. Robert Scott reveals interesting features about this setting. Full circle Gerard Maas has been trying out an accessory which turns your Speedlite into a ring flash for portraits and macro images. My camera Camera customisation. There are many ways you can personalise your digital EOS and make it your own. How was it shot? Julian Knight’s aim was to produce an Enchanted Garden image that conveyed a feeling of pure fantasy. He tells us how he achieved this ethereal look within the confines of a small studio. Tilt-and-shift Craig Roberts explains how he uses the Canon TS-E 24mm tilt-and-shift lens with the Canon Extender 1.4x Mk II – an unusual but versatile combination that produces some great results. HTP at work Highlight Tone Priority is a much-talked about feature found on the latest EOS cameras. It offers great benefits to some users, says David Newton, but should be used with care. Style editor You can set your digital camera to capture images to your exact preferences. Andrew Gibson shows you how to create your own Picture Styles with Canon’s Picture Style Editor software.